The final event of a tremendously long weekend comes to a head. The crowd, of course, is bigger and louder because it is the mighty 3A- the best of the best. As the 2A events were wrapping up, the girls long jump and several others were in the process of starting. Madison Myrick (Sr., Homewood-Flossmoor) would be competing on two fronts. The long jump has been good to her this season. Thus a tight battle vs. class leader Raelyn Roberson (Jr., Glenbrook South) ensued. Roberson struck hard with a 19-1 effort in the second round that held up to the fifth attempts. Myrick would go from sixth to first with the winning 19-1.75. Roberson could only muster 19-1.5 on her last effort... tired legs must have done Myrick in for the high jump because Grace Daun (Sr., Wauconda) came in and won with a 5-6 clearance. Daun is the defending state champion who is ready to mark her territory each time out. Four girls shared the 11-6 pole vault clearance but Kelsey Rothas (Jr., Lake Zurich) was the winner. She had less misses overall and had a solid attempt at making 12-feet. The best field event action of the weekend was the triple jump. This is a strong year to be a leapfrogger and it so happens that many of the state's creme of the crop is here. The IL #1 Riley Ammenhauser (So., Neuqua Valley) has not suffered the proverbial "sophomore slump" this winter. Instead, she should be nicknamed "Ms. 40-feet" for her consistency in that category. Ammenhauser took the lead on her first jump which was 38-9.25. She would take eventually hit on 40-0.5 on her fifth attempt. Some eyes were on Daryn Davis (Jr., Huntley) who has been impressive in her own right. Coming in as the second-ranked jumper she stayed in the second position with a 38-7.25. Davis struggled a bit with three fouls. Home cooking was clearly not in her favor in the tough Shirk Center confines. If we were to include a merge for the shot put, Jasmine Mitchell (Sr., Thornwood) would become the winner based on her 47-7.5 winner in the fifth round. Mitchell had four of six throws over 45-feet. She is clearly ready for the outdoor season. Kaylah McCall (Jr., Homewood-Flossmoor) and Kayla Walters (Jr., Bolingbrook) have clearly been the best short hurdlers in the state this season. It would be no different as both stalwarts advanced to the 60H final with ease. Once there it was all business. McCall got out well but Walters moved strongly over the barriers. McCall hit the finish line first and Walters second in bang-bang fashion. McCall nearly got the all-time record with a sizzling US#13 8.47, but she will take the 3A stature for now. The consolation prize for Walters is a US #18 8.55 and her best ever performance. As difficult as the hurdles are, the 60m is a tricky one too. Some key faces were absent and some others have not had enough meets to be considered lathered up. One of those names under the covers was Taylor Gilling (Sr., Highland Park). She had been incognito and racing "locally" as she called it. But in reality, we all know that she had been in the lab. Finally, 7.65 flashed on the board for Gilling in the prelim. McCall tallied with a 7.69. Maybe the final would be interesting. Ameia Wilson (Sr., Danville) is always dangerous. Gilling bust the bubble immediately as she dashed to a new state leading 7.53- moving her into the top 30 in the nation and elevating her as the one to watch outdoors in the 100m. Noticeably absent from the 400m championship section was Dajour Miles (Sr., West Aurora). 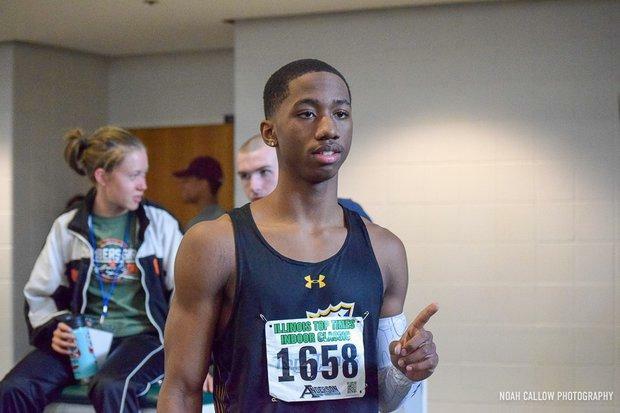 Cinnamon, of course, is the top quarter-miler in the state and one of the elite sprinters in the country. But strangely she competed just a few days prior at the Batavia Bulldog Relays. Whatever... the golden opportunity was immediately seized by Ashanti Denton (Jr., Homewood-Flossmoor). As the Lady Vikings top long sprinter, she is one of the team's catalysts. And as the race unfolded she handled Taylor Wright (Sr., Lincoln-Way East) and took the win in 57.95. Wilson would tangle with Taylor in the 200m. It was a close one for throughout the race but the state leading Wilson held on for the win 24.78-24.89. Alex Morris (Sr., Naperville North) needed a few races to get herself lathered up. Part of that process is taking a few lumps upside the head along the way so when the championship season arises, she will be ready. Hart entered as an underdog in a race in the state of Illinois for the first time. That race is the 800m. This is where we witnessed the coming of age of a superstar. Erin Reidy (Jr., Downers Grove South) and Claire Hill (Sr., Naperville North) have been the talk of the town. Add in Marne Sullivan (Sr., New Trier) and even Mikenna Robinson (Sr., Neuqua Valley) who are capable of betting Hart. Nope. Hart took it to them all shortly after the race unfolded, using the good old front running tactics. Hart was relentless against the field and Sullivan was the only one who tried to unseat her. Hart's 64 second first half good enough as she went on to run an all-time record and personal best 2:10.63. Sullivan also earned a personal best in second running 2:12.75. Hart returned several hours later to finish off some business in the 1600m. She immediately separated from the field through a first half in about 2:21 to run 4:48.06- dropping three seconds from the previous record. It was a great finish for four others who broke 5:00. One of those runners was a freshman Aly Negovetich from Grant. She set a school record 4:58.88. Some defections deflated what potentially could have been a great show in the relays. Downers Grove South was still the favorite in the 4x800 despite ace Reidy running in the open. Depth is important and the Mustangs needed it since they would have a tired leg Brenna Cohoon (Jr.) doubling back just 25 minutes from the 3200m. DGS battled Yorkville and Prospect throughout the affair. Cohoon was able to pull out the win down the stretch and when it was all over the clock read 9:28.06. Yorkville relegated themselves to second in 9:28.40 and Prospect 9:28.73. 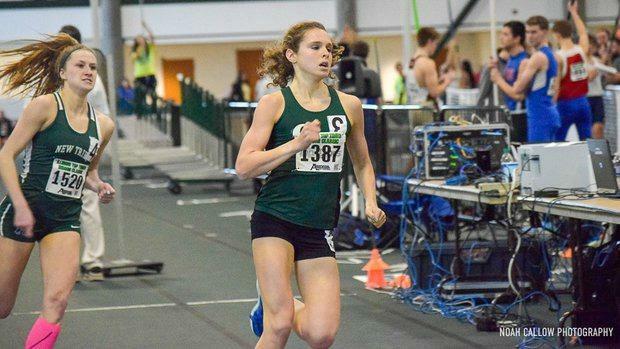 The Shirk barn began to heat up prior to the start of the 4x200 on the strength of Homewood-Flossmoor running a blazing time and running away from the competition. The Lady Vikings prevailed comfortable in the championship race and set a state-best 1:42.64. The final was not met by excitement from the fans or the quartet who was looking for 1:41 low. The transitions and stick play still need work as the season heads outdoor... the Lady Vikings closed out the meet with another state leading win taking the 4x400 in 3:59.09- almost 10 seconds better than Grant. Kenwood ran 4:06.55 to win section 1. Evanston declined an invitation to compete instead ran at the "Fast Times" hosted by Lewis University. The Wildkits ran 4:02.30 without their best 400 runner Gabby Horton (Jr.) who instead competed in the 4x8. More weirdness was the fact that West Aurora chose to compete Wednesday at Batavia in a lower risk environment. Bring on Saturday, May 18 already. Victor Cameron (Sr., Crete-Monee) doesn't seem tired of proving himself in the sport of track and field. Maybe he has ear muffs on when college recruiting coaches are whispering about him not being able to hurdle at the next level. All Cameron has done this season is win and to add salt to the wounds of the so-called experts, he broke a legend's record. That's right the great William Session of Belleville East was a wrecking ball over the barriers a few seasons ago. Cameron put up a 7.82 in the 60HH final. So much for hurdle height right? Not much talk of the great Marcellus Moore (Jr., Plainfield North) coming in. The megastar took a much need rest from competition. The question now is how would he respond from the idle time? Moore bolted from the blocks in his 60m prelim with ease in 6.89. That would probably be more than enough for the win had it been the final. Moore lives for challenges and the one in front of him was the all-time record 6.79 by Decatur MacArthur's Jonathon Boey. Moore's personal best is light years ahead of that. The final should just how strong he was as he blazed the track afire in 6.73 and glued his name atop the list. Jason Thormo (Sr., Grant) has some big goals this season and one of them was to win the Top Times crown. He accomplished it from the front running position and with ease in 50.02. Moore may have been a bit winded from racing on the 4x200 prior to the 200m. In the end, it was insignificant as "Baby Holyfield" got a first round knocked decision over challenger Jermarrion Stewart (Jr., Collinsville) 21.79-22.69. It took a while but the 3200m came through with the marks that we expected this season. Depth proved its head as the next emerging elite group stepped up. Jared Kreis (Jr., Lincoln-Way Central) pulled the pace through the first 1600 in 4:34 and that was a set up for a very good time for the event. Kreis checked the field a few times over the next several laps but was in total control virtually the entire way in winning in a state-leading 9:10.59. Guillermo Ibarra (Jr., Morton) dropped Tommy Brady (Sr., Maine South) for second with a massive personal best 9:11.74. All 14 runners broke 9:45. I:58.38 was not the time that purists were looking for in the 800m. But Grant Jensen (Sr., Prairie Ridge) will take it and hopefully, it will springboard him to a great outdoor season. The race that had everyone anticipating was the 1600m. Andrew O'Keefe (Sr., Granite City) wanted a fast pace so he could thrill the crowd with an exciting performance. But the group led by Sam Rivera (Sr., Whitney Young) would not give it to him. Things slowed down a bit at the halfway point. But we have seen what was going to come next, the "O'Keefe surge" as he pressed the turbo button on the next few laps and the race was over, the verdict flashed 4:14.77. Rivera finished second in 4:17.69. It's very rare that the 4x800 takes a backseat to any relay at a major meet in the state. But the omission of some star power pushed the next group of emerging teams to the forefront. Dekalb, Lane Tech, West Aurora, and Evanston hope to be those teams standing on the all-state podium in late May. Evanston struck first with a strong leadoff leg followed by Lane Tech against a few others over the next two. Dekalb's Aidan Donohue powered home the Barbs with a smoking 1:55.6 split and the win in 8:04.45. Lane grabbed second over Evanston 8:06.82-8:08.80. The Crete-Monee freak show started with the 4x200 where everyone waited patiently for section 4. As expected Plainfield North was able to obtain the lead on the strength of Moore's blazing leg. But unfortunately for the Tigers, they only had one bullet in the gun chamber. The Warriors would take over the race before the end of the next leg and run them and everyone else off the road in record time and US#14 1:29.13- also the #2 time on a flat track in the country. In other words, this team has an opportunity to be very special this spring. The showstopper was initially billed as the appetizer, but not so when the final results poured in. Crete-Monee back with several members of the previous relay, it looked like another blowout in the making. Give Grant credit for hanging around and giving their star Thormo a chance at the impossible. He almost pulled it off with a 48.3 anchor carry. Both teams ran outstanding times but the Warriors got the win 3:21.06. Grant also performed well in second with a school record 3:21.79. Sam Liokumovich (Sr., Deerfield), Joe Boyer (Sr., Rolling Meadows), Jordan Johnson (Sr., Quincy), and Amiri Buchanan (Sr., Romeoville) came with serious hype. All four were ranked in the top 40 nationally prior to the meet. Liokumovich left as the leader of the pack winning with a US #4 64-4.75 bomb. Boyer was next at 61-0.25. Buchanan held the third spot over Jordan. Perhaps the only time that we will see a team sweep in a long jump on a large meet scale. Crete-Monee was led by Jamal Safo whose 23-1 paced the way. Raejohn Pearson and Kavon Jones were right there. Andrew Saloga (Jr., Marmion Academy) won the PV at 14-8. David Lehenbauer (Sr., Lemont) surprised the high jump field with a career-best day in winning with a leap of 6-7.